Inflammation occurs when your body’s chemicals and white blood cells protect you from infection and foreign substances such as viruses and bacteria, according to the Cleveland Clinic. Some common diseases associated with inflammation include arthritis, gout and bursitis. Anti-inflammatory medications may reduce inflammation; however, certain herbs such as ginger root can also help lessen inflammation. Always speak with your physician before using herbs for treating any health condition. Inflammation may cause a variety of symptoms. Some symptoms of inflammation can include joint pain, stiffness, redness on or near the joint area; joints that feel warm to the touch and possible compromised joint function. In addition, more severe cases of inflammation can result in flu-like symptoms such as fever, chills, headache, loss of appetite and fatigue, according to the Cleveland Clinic. Ginger has been used medicinally since ancient times in many countries. It has been used to treat conditions such as upset stomach, diarrhea and nausea. The volatile oils and pungent phenol compounds are the active ingredient in this herb. According to the University of Maryland Medical Center (UMMC), ginger is commonly recommended by health care professionals for nausea prevention due to morning sickness, motion sickness and chemotherapy treatments as well as an aid in inflammatory conditions like arthritis. A study conducted with 261 participants diagnosed with osteoarthritis of the knee experienced less pain and required less pain-killing medications after taking ginger extract twice per day, according to the UMMC. However, one trial showed that ginger was no more effective in treating inflammation than ibuprofen or the placebo. Ginger is available in many forms and can even be obtained through your diet by drinking ginger ale or eating ginger bread. 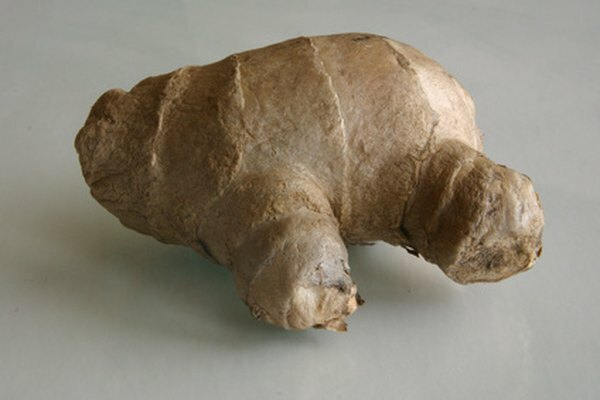 Most ginger products are made from dried or fresh ginger root and is available as capsules, tinctures and oils. According to the UMMC, ginger consumption should not be more than 4 g per day including the amount obtained through food and drink products made with the herb. To relieve inflammation due to arthritis pain, the university suggests taking 2 to 4 g of ginger per day in the form of tea, extract or ginger juice. Ginger oil may also be applied topically to the inflamed area.